Claudio Dall’Albero is a new name to me, a contemporary Italian composer largely, it appears, of sacred music. Information regarding his birthdate is elusive (despite forensic scrutiny of an array of Italian musical websites). His own website, www.cantorisancarlo.it, reveals that he has been involved in the performance and composition of sacred and other music for a multitude of organisations, It also appears he has been a composer-in-residence at the Vatican. He has conducted a great deal of musicological work and authored a biography of the Italian Renaissance composer Carlo Milanuzzi (c1590-c1647-no problem with his – albeit approximate-dates!). The photograph of him in the disc booklet suggests he is not too venerable, indeed his coiffure suggests he might comfortably slot into the midfield of any half-decent Serie A football XI. So much for these slivers of background. What of his music? 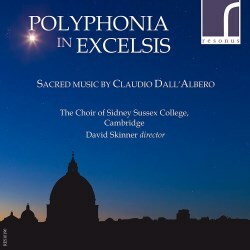 The present disc, scrupulously performed by the Choir of Sidney Sussex College, Cambridge under its Gramophone award-winning director David Skinner is built around a mass, the Missa ‘De Angelis’. This is bookended by seven shorter sacred choral works and its two halves separated by a tripartite organ suite inspired by Cambridge, the Trittico di Cantabrigia whose movements are democratically shared between Resonus stalwart Stephen Farr and two talented resident organ scholars, Jim Cooper and Laurence Carden. Much is made in the notes of how Dall’Albero’s music is imbued with the essence of the ancient Roman artisans. Each individual piece and each movement of the Missa is certainly skilfully constructed. The technique owes much to Italian renaissance masters (for some reason Felice Anerio in particular comes to mind); Gregorian chant is never far away but most interesting of all is Dall’Albero’s sophisticated use of the old modes. The beautiful five-part In medio ecclesiae, which opens the disc, makes telling use of the Phrygian mode, but the dissonances which come to the fore in the central section make it clear that this is music of more contemporary provenance. The concise Parvulus filius which follows is a delicate and attractive Christmas motet woven in the Lydian/Ionic mode. The more recent and elaborate Magnificat VIII Toni employs a call and response type of structure, tastefully alternating Gregorian chant and polyphony. At this point, however, it began to strike me that fulfilling and attractive as this music most certainly is, it’s a tough ask to appreciate the whole disc in an unbroken 70 minute span, even with the textural variety provided by the splendid organ work. This is neither showy nor overbearing and was written especially for the new Flentrop organ at Sidney Sussex. The three movements all allude to the college and to Cambridge itself. I very much enjoyed the second, inspired by jogging on Jesus Green , particularly the piquant descant passage in the middle, and the solemn final passacaglia alluding to a portrait of Lady Frances Sidney. Somehow Dall’Albero infers a recognisable Englishness in this music, although no particular composer or school springs immediately to mind. Indeed it may have something once more to do with the modal foundations of each panel. The architecture supporting the austere Missa ‘De Angelis’ is also tangible and impressive, its movements infused with strong but never cloying Gregorian flavours. But perhaps the following two choral works touched me most- the celebratory motet Psállite Domino, its opening thrillingly caught by the Resonus producer and engineer Adam Binks and especially Fuga Francescana, which makes use of an Arabesque mode which underpins its exoticism. The choir, needless to say, sounds splendid, secure in the notes and utterly convinced by the quality of the music. The recording and presentation are first class (all texts and translations are included) as is the custom from this source. Dall’Albero’s is a name I shall certainly seek out in future, but I got the most from this music (and there is much to enjoy) by listening to it in two segments, possibly the Missa and Trittico in the first sitting, followed by the opening and concluding shorter works.